Produced by long-time collaborator and brother, Bill Bentley, this third album contains a mixture of up-tempo rockers, like "Black Diamond Girl" and "Afterlife" as well as the dreamy soundscapes "While Away" and "Holiday" (Grant's first Christmas song). 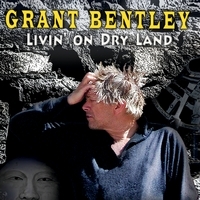 This is the third album from singer/songwriter Grant Bentley, who now lives in the high desert mountain town of Bishop, CA. Produced by his long-time collaborator and brother, Bill Bentley, the album contains a mixture of up-tempo rockers, like "Black Diamond Girl" and "Afterlife" as well as dreamy soundscapes, like "While Away" and "Holiday"(Grant's first Christmas song). You won't want to miss the sultry Latin-infused "Fallen Into Me" or the world music sounds of "Search For The Meaning", written while Grant was on a trek to the base camp of K2 in Pakistan. Follow along as Grant tries to make sense of it all - Livin' on Dry Land.